A bildungsroman for the toy locomotive set. 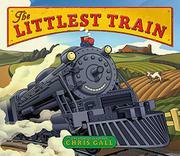 A little train spends his days immersed in a lovely life circling his little toy town. But when Mr. Fingers, the hand that controls the little train’s world, accidentally knocks the toy to the floor, a mouse hole provides an avenue for exploration. Once he starts looking around, a series of real trains, from steam locomotives to freighters to bullet trains, show the little toy the wider world. Yet when he wants to return home, he finds the means and the method more difficult than expected. Fortunately a lucky break leads to a happy ending. An afterword provides additional information about each type of train featured in the book. With digital art reminiscent of the woodcuts of old, Gall strives to evoke a bygone era of children’s literature and largely succeeds. The look is complemented by classic storybook language, as in the opening line: “In a small room, down a short flight of stairs, there lived a little train.” He proves himself unafraid to simultaneously summon the awe-inspiring size and power of locomotives and the cozy comforts of a child’s beloved toy. Kids will get a special kick out of comparing the similarities between the toys of Mr. Fingers’ world and the real world the little train explores.